(TG)- Tell us about yourself. (Strawberry Roan)- Well, I was born in North Dakota about 3 miles south of the Canadian border. I'm an Air Force brat, so I moved around a lot growing up, most of the time being spent in the Midwest and the South. I graduated from Milton High School in Milton, FL and went to college for 3 years majoring in agribusiness with a minor in psychology. Marriage interrupted the college plans and I went on to my first career working with at first, the mildly developmentally disabled, then at a state institution for the severely and profoundly mentally and physically handicapped in Redfield, South Dakota. I was first introduced to firearms and specialized in precision rifles and silhouette shooting. The next phase of my life found me as a single mother supporting one son and looking for a career that would provide well for us without having to finish the degree I had started, as well as one that would challenge me and help others. I ended up putting myself through both EMT school and then police recruit training in Pensacola, FL. The Sheriff's Office hired me first, and I was assigned as a patrol deputy for Escambia County, FL. I spent 7 1/2 years on patrol and was then assigned to Judicial security, during the abortion clinic bombings and increased attacks against judicial personnel. I made Deputy First Class and retired in 1997 due to several work injuries as well as being diagnosed with rheumatoid arthritis. Since that time, I've had to learn to slow down some and smell the roses along the way. I remain as active as possible on my good days and taught myself how to spin wool, knit and raise angora rabbits for their fiber to keep me occupied on my bad days. I met O.L. in 2005 and thankfully, he decided I was a keeper, so he married me. Best thing that ever happened to me! (TG)- What do you do for a living? (TG)- How long have you been bow hunting with traditional gear? (Strawberry Roan)- Well, I was introduced to bows in Feb. 2005 and I've been on "practice" hunts, but I haven't hunted formally yet. It is important to me to be as competent and confident as possible before risking wounding an animal. I know it happens to the best of us, but I don't want to push the envelope and cause unneccessary suffering. (TG)- Any heroes? Any role models? (Strawberry Roan)- O.L. of course, and all the military personnel that fight for our freedom, as well as emergency personnel such as law enforcement, firefighters and EMT's that risk themselves to help others. People who do the right thing even when there are no witnesses or there is significant personal cost. (TG)- Which eye is your dominant eye? (TG)- Do you shoot right handed or left handed? (TG)- What got you started bowhunting? (Strawberry Roan)- Seeing the incredible damage that feral hogs and other ferals do to the wildlife habitat here in New Mexico, Texas and Oklahoma. (TG)- Who first helped you get involved in traditional bow hunting? (Strawberry Roan)- O.L. of course! 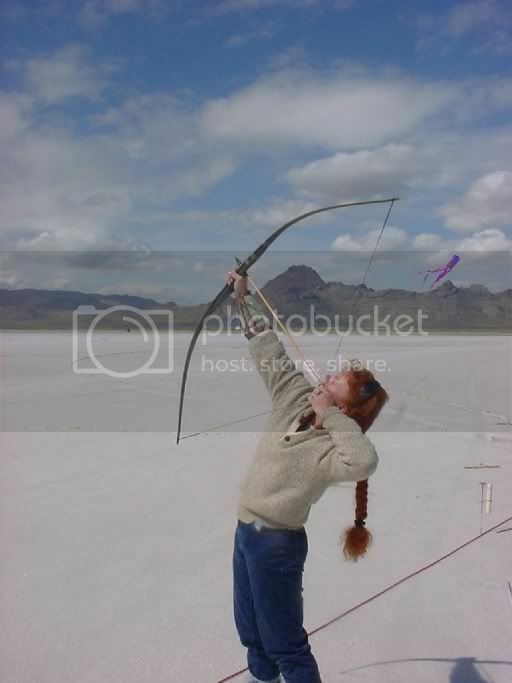 (TG)- Do you remember the first animal you took with a traditional bow? Tell us about it! (Strawberry Roan)- Working on making memories of my own. My first occasion to go with O.L. hunting resulted in him taking a javelina. It was funny, we had sat in a tree stand all afternoon and had just seen one female with a yearling come through, but not close enough for a shot. It was getting pretty close to sundown and we had decided to call it a day. We had just climbed down and were getting our gear together, noisy as all get out, when O.L. looked up and saw a bunch headed right down the road to us. I crouched down behind the tree and O.L. ran towards them, then jumped off into the bushes. Incredibly they still hadn't seen or heard us. They came right up and passed by O.L. and he got a shot at a boar. The boar was quite aggravated about the thing biting him and was growling at it, trying to outrun it. He didn't get very far and we were able to quickly track him even in the dark. I found I like the taste of javelina! Hopefully, I will have some tales of my own exploits soon! (TG)- Do you prefer a glove or tab? (Strawberry Roan)- I prefer a tab which offers greater protection for arthritic fingers. (TG)- Do you have any favorite memories or kills that stand out? Tell us about it! (Strawberry Roan)- That's a hard one, because each time O.L. and I go out in the woods and enjoy Mother Nature together is a favorite memory. (TG)- Can you tell us a bit about your preferred hunting combo? (Strawberry Roan)- Still working on that one, I'm leaning toward a 50lb. ACS CX with Grizzly Sticks and extremely sharp STOS broadheads for what I would be hunting. (TG)- What is the one piece of advice you would give a new hunter to aid him on his hunting ventures? (Strawberry Roan)- Find a good mentor, hold yourself to the highest ethics and practice, practice, practice! (TG)- What is your favorite animal to hunt? (Strawberry Roan)- Hogs and bears, of course, if they put tags out for pedophiles, those would be at the top of my list. (TG)- Do you have or prefer a certain method of hunting? (Strawberry Roan)- I love to stalk things, but I also enjoy sitting in a blind with O.L. (TG)- Does any of your family hunt or fish? (Strawberry Roan)- My grandparents fished and would take me on occasion. (TG)- Do you have any bowhunting goals or plans for the immediate future? (TG)- Do you make any of your own gear? (TG)- Where is the one place you would really just love to hunt? (Strawberry Roan)- Anywhere deep in Mother Nature is good. (TG)- Do you primarily hunt private or public ground? (Strawberry Roan)- I prefer public land that is remote. (TG)- Do you prefer evening, mid day or morning hunts? (Strawberry Roan)- Anytime is good! (TG)- What is your favorite type of camo? (Strawberry Roan)- Well, I'm looking forward to seeing how well this ghillie suit I'm working on does. (TG)- Do you normally use anything like scent covers or attractants, camo, or calls? (Strawberry Roan)- Well, I smoke, so scent cover doesn't do much, I like trying different kinds of camo and I'm still learning about calling, so I don't have an opinion on that yet. (TG)- Do you do any small game hunting? (Strawberry Roan)- No, I prefer to hunt critters that can hunt me back. (TG)- Tell us what your dream hunt would be. (Strawberry Roan)- I'm looking forward to going to Alaska in September and Australia next year if all goes well. (TG)- Tell something on O.L. that will get you in trouble. (Strawberry Roan)- Ok, LMAO, I guess I need to ask: in trouble with who? I don't think I could get in troublewith O.L., although I could sure make him blush, lol. Probably a lot of other folks too, heh, heh. Seriously, O.L. really is the honorable, decent, patient,( endlessly patient!) intelligent person he comes across as. (TG)- What do guys need to do that would encourage our wives/girlfriends to get involved? (Strawberry Roan)- Hmm, well, first of all, I would say love/accept them just the way they are, some girls are just more outdoorsy than others. Put yourself in the reverse position of her teaching you girly stuff! Then, encourage trying things a little at a time, no pushing or impatience if she doesn't catch on like you think she should, even if you showed her a thousand times already! Keep in mind she's probably trying real hard to please you and will get flustered easily. Be okay with it if she's wanting to take a break. If it's been longer than 2 or 3 weeks, let her know you miss her out there with you, not guilt tripping or nagging, just let her know you enjoy her company. (TG)- Kind of along the same lines, what is the one thing guys should do? (Strawberry Roan)- When she makes a mistake, even a stupid one, no chewing out or impatience. If she does something right, a big smile, hugs and kisses work great(for me anyway!) Try to make it about enjoying each other, not trying to accomplish something. (TG)- For those of us who have never been invovled with it, explain flight shooting. (Strawberry Roan)- Ah, flight shooting is fun! It was probably the first competition involving bows and the original inventors. "my bow will shoot farther than yours". It involves a lot of tweaking the arrows. With longbows, only wood arrows with feather fletching is allowed. Getting the arrows spined correctly for the bow, your draw length and the correct FOC is important, as is the proper shooting angle to maximize the trajectory upon release. The tapering of the arrow is important, the size and stiffness of the fletching and a good clean release all go together in maximizing the distance the arrow achieves from your bow. The bow itself is important, as you want it to put as much energy into the arrow as possible. O.L. can explain the physics and aerodynamics better, but that's the gist of it. Interestingly enough, if you see the arrow, it probably didn't have good distance. It's the ones that smoke out of there and disappear instantly that give those world records. (TG)- What is one thing I haven't asked you that you would like people to know?